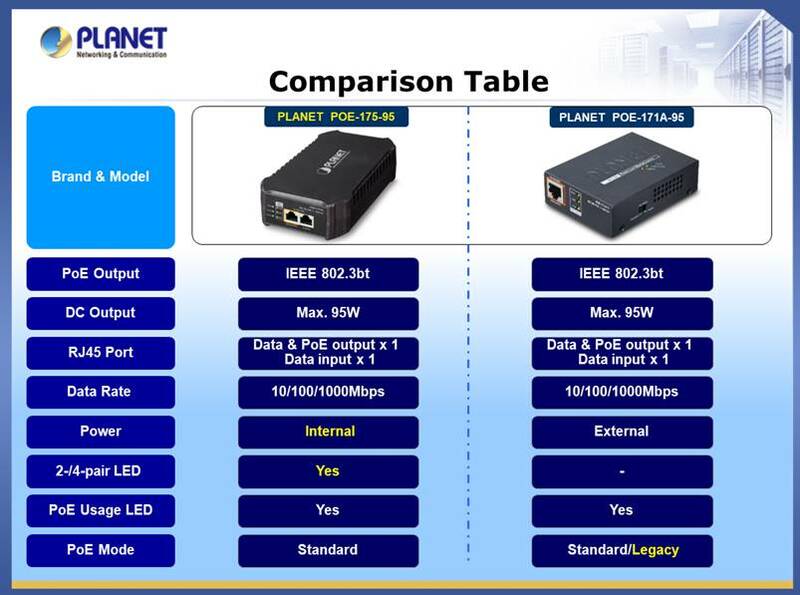 PLANET’s POE-172S Gigabit ultra Power over Ethernet splitter, Ultra PoE 802.3bt Ready IEEE 802.3at, delivers Ethernet digital data and ultra PoE power over twisted-pair cables to network devices. 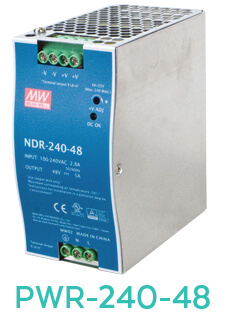 It separates the digital data and the power into three optional outputs (12V/19V/24V DC) and supports a transmission distance of up to 100 meters. The POE-172S has no restrictions due to power outlet locations, thus eliminating the costs for additional AC wiring and reducing the installation time. 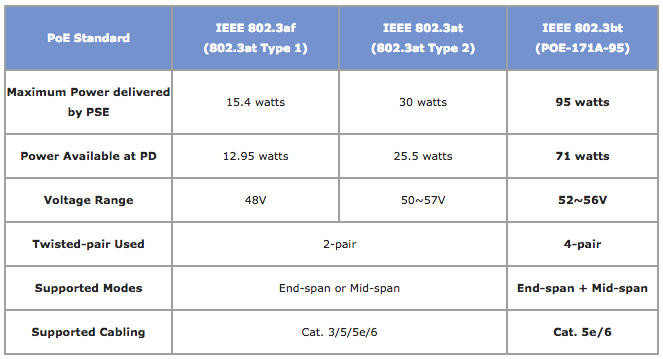 The POE-172S and 802.3bt Ultra PoE switches use cables that meet the IEEE 802.3bt/at/af standard. Instead of delivering power over 2-pair twisted UTP cable, end-span (Pins 1, 2, 3 and 6) or mid-span (Pins 4, 5, 7 and 8), they are able to transmit ultra PoE power and data by using all the four pairs of standard Cat5e/6 Ethernet cabling. The POE-172S comes with a compact-sized metal housing allowing for convenient placement of the unit. It features a ventilated construction in which a cooling fan is not necessary, thereby making its operation noiseless. 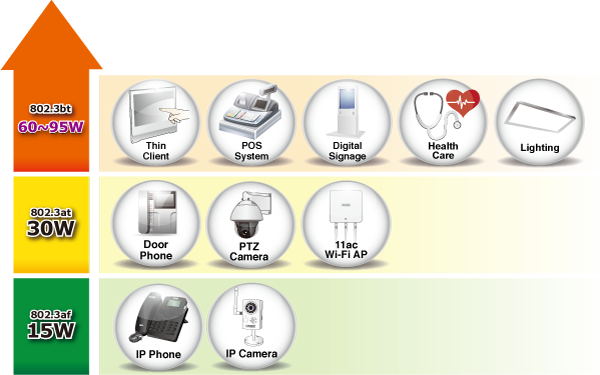 Moreover, the POE-172S is able to operate reliably and stably without affecting its performance. The deployment of non-PoE equipment with constant power feeding can be done quickly and easily. 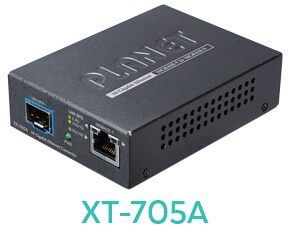 PLANET’s POE-175-95 is a Single-Port, 802.3bt Power over Ethernet Injector with a maximum of up to 95 watts of power output over Ethernet cables. The POE-175-95 delivers Ethernet digital data with 54V DC power over the twisted-pair cables as a 95-watt Power over Ethernet Injector. When connected to the POE-172S, ultra Power over Ethernet splitter, it will separate digital data and power into three optional outputs (12V/19V/24V DC) with maximum distance of up to 100 meters. 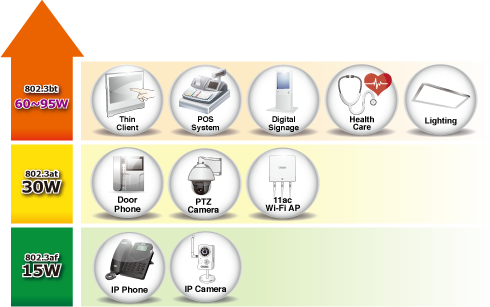 The POE-175-95 and POE-172S Ultra PoE solutions use the same cabling standard as IEEE 802.3af/at PoE. Instead of delivering power over 2-pair twisted UTP, end-span (Pins 1, 2, 3 and 6) or mid-span (Pins 4, 5, 7 and 8), it provides the capability to source up to 95 watts of power by using all the four pairs of standard Cat. 5e/Cat. 6 Ethernet cabling. The POE-175-95 helps users monitor the current status of PoE power usage easily and efficiently via its advanced LED indication. “PoE Power Usage” displayed on the front panel of the POE-175-95 has three LED indicators of different power usages. Via the power usage LED, the POE-175-95 enables the administrator to monitor the status of the power usage of the connected PDs in real time. The PoE injectors ‘Plug and Play’ functionality is easy to install and comes with simple troubleshooting, making it easy for business and home users to own it. The POE-175-95 comes in compact housing, and has a built-in internal power supply. The side panel of the POE-175-95 features one 100-240V AC input socket, real-time LEDs (Power LED, PoE Usage LED and 2-/4-pair LED) and two RJ45 ports (Ethernet port and Ethernet + DC port). Simply plug in the Ethernet cables and AC power cord, and the POE-175-95 is ready to provide high-speed network communication and 802.3bt PoE++ injector functions simultaneously with no need of software configuration. 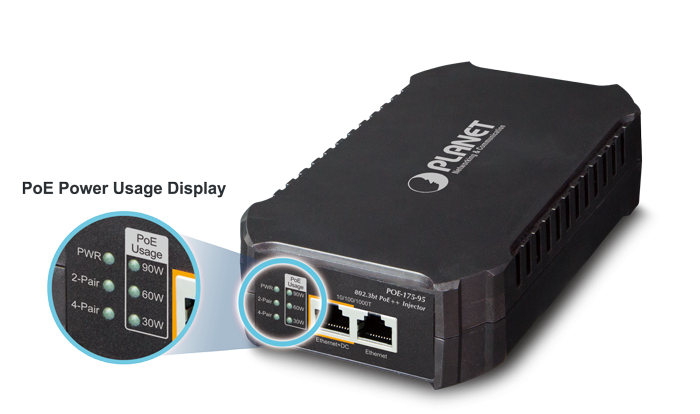 PLANET’s POE-171A-95 is a Single-Port, 802.3bt Power over Ethernet Injector with up to 95 watts of power output over Ethernet cables. 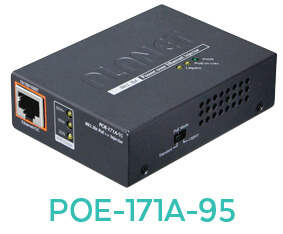 The POE-171A-95 delivers the Ethernet digital data with 54V DC power over the twisted-pair cables as a 95-watt Power over Ethernet Injector. 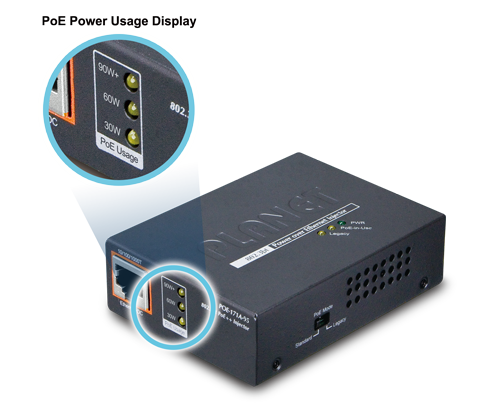 When connected to the ultra Power over Ethernet splitter, the POE-172S will separate the digital data and the power into three optional outputs (12V/19V/24V DC) with distance up to 100 meters. When switched to the legacy mode, the POE-171A-95 provides power to those PD devices which do not fully follow the IEEE 802.3af/at/bt standard. The legacy LED will be turned on when the legacy mode is enabled. The unit helps users to monitor the current status of PoE power usage easily and efficiently via its advanced LED indication. “PoE Power Usage” displayed on the front panel has three LED indicators of different power usages. Via the power usage LED, the POE-171A-95 enables the administrator to monitor the status of the power usage of the connected PDs in real time. The POE-171A-95 and POE-172S Ultra PoE solutions use the same cabling standard as the IEEE 802.3af/at PoE. Instead of delivering power over 2-pair twisted UTP – be it end-span (Pins 1, 2, 3 and 6) or mid-span (Pins 4, 5, 7 and 8), it provides the capability to source up to 95 watts of power by using all the four pairs of standard Cat5e/Cat6 Ethernet cabling. In the new 4-pair system, two PSE controllers will be used to power both the data pairs and the spare pairs. The PoE injector is easy to install by the way of Plug and Play and comes with simple troubleshooting, making it easy for business and home users to own it. The POE-171A-95 comes in compact housing, and provides one 52~56V DC input power jacket, one power LED, PoE-in-use LED and legacy LED. There are two RJ45 ports on the side panel, the Ethernet port and Ethernet + DC port. Simply plug in the Ethernet cables and DC power cord, and the POE-171A-95 is ready to provide high-speed network communication with no need for software configuration. Backward compatible with both 802.3af/at PoE standards, the POE-171A-95 allows users to flexibly deploy standard and high powered devices to transfer data and power simultaneously through one Ethernet cable for up to 100 meters. The POE-171A-95 reduces installation time, cables and eliminates the need for electrical outlets on the wall, ceiling or any unreachable place. The POE-171A-60 delivers the Ethernet digital data with 54V DC power over twisted-pair cables as a 60-watt Power over Ethernet Injector. 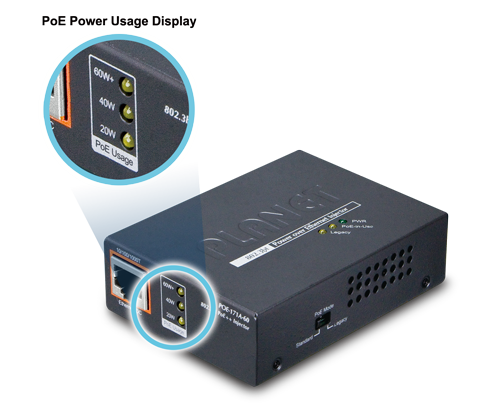 When connected to an ultra Power over Ethernet splitter, the POE-172S will separate the digital data and the power into three optional outputs (12V/19V/24V DC) with distance of up to 100 meters. The POE-171A-60 was built in Legacy mode to provide the power to those PD devices that do not follow the IEEE 802.3af/at/bt standard. Through its advanced LED indication, the injector helps users to monitor the current status of PoE power usage easily and efficiently. “PoE Power Usage” displayed on the front panel of the POE-171A-60 has three LED indicators of different power usages. Via the power usage LED, the POE-171A-60 enables the administrator to monitor the status of the power usage of the connected PDs in real time. The POE-171A-60 and POE-172S Ultra PoE solutions use the same cabling standard as IEEE 802.3af/at PoE. Instead of delivering power over 2-pair twisted UTP – be it end-span (Pins 1, 2, 3 and 6) or mid-span (Pins 4, 5, 7 and 8), it provides the capability to source up to 60 watts of power by using all four pairs of standard Cat. 5e/Cat. 6 Ethernet cabling. In the new 4-pair system, two PSE controllers will be used to power both data pairs and spare pairs. The PoE injectors easy to install, Plug and Play system comes with simple troubleshooting, making it easy for business and home users to own it. The POE-171A-60 comes in compact housing and provides a 52~56V DC input power jacket, power LED, PoE-in-use LED and legacy LED. Two RJ45 ports (Ethernet port and Ethernet + DC port) are on the side panel. Simply plug in the Ethernet cables and DC power cord, and the POE-171A-60 is ready to provide high-speed network communication and the 802.3bt PoE injector functions simultaneously with no need of software configuration. 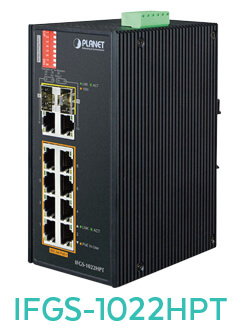 Backward compatible with both 802.3af/at PoE standards, the POE-171A-60 allows users to flexibly deploy standard and high powered devices to transfer data and power simultaneously through one Ethernet cable for up to 100 meters. The POE-171A-60 frees up devices from restrictions of power outlet locations and the additional AC wiring. It reduces cables, eliminates the need for electrical outlets, and reduces installation time.